Yes you read the title of the blog right, our kitchen cabinets are in the process of being painted! THEY ARE FINALLY GETTTING PAINTED WHITE!! I can’t say that or read that enough. If fact, while sanding the cabinets while my neighbors glanced in curiosity of what I was doing, I wanted to shout and tell them all. Literally, I thought this day was never going to come so it’s surreal that it’s finally here and I’m doing it. It’s happening and there’s no going back now!! 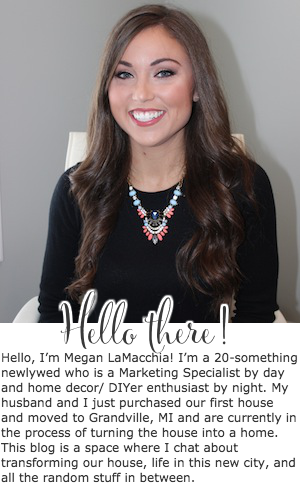 Some of you might be confused because I’ve gone back and forth on this project many times on the blog and you might be thinking, ‘wait, I swear you wrote a blog post the other month about you keeping the orange maple cabinets!’. 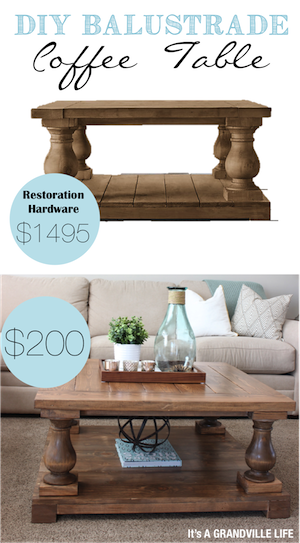 To spare you all from my own marital DIY home improvement project drama, (If you have ever worked on a project around the house with your spouse, you know this is real thing), simply put my husband changed his mind like 10 times of whether he was ok with it and after much begging and reiterating how much better it will look with the rest of our house and the added value it will bring(since he is numbers person) he finally was okay with it. Right when he approval I jumped on it so he wouldn’t have time to change it. Also, a huge reason why he didn’t want to do the project was because how time consuming it is and he didn’t want to have to do it, so I have signed up to tackle this project on my own! OK now that you have the background story let’s start talking getting into the fun project details! I’m going to break this kitchen project up into multiple posts, so today I’m sharing the prepping steps. No onto the step by step guide of what I did to prep the cabinets! 1. 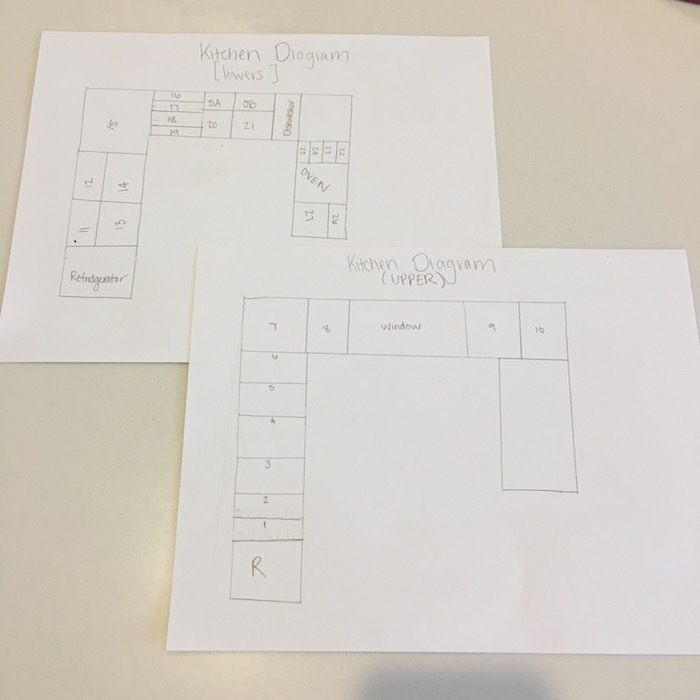 Create a diagram of the kitchen cabinets and assign a number to each cabinet and drawer. The purpose of doing this is that after everything is painted, you want to make sure that you know where to put everything back to so it doesn't become a not so fun guessing game. 2. Using painter's tape and sharpie, create 3 labels for each cabinet with the corresponding number you assigned in step 1. One label will go in the inside of the cabinet base, another label on the actual cabinet or drawer, and the last one put on a zip lock bag. For the cabinet doors I just put the numbered piece of tape inside where the hinges usually go since it won't be painted. 3. 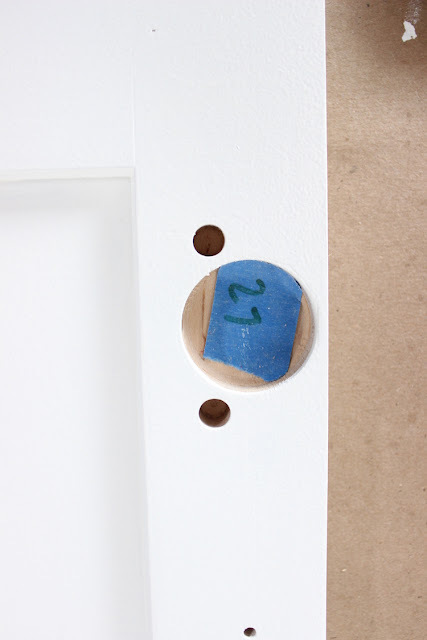 Remove the cabinet door and existing handle/pulls, and put all of the hardware into the zip lock bag with the corresponding number. This way, you know which hardware goes with what door. Then I chose to store all of the bags of hardware in a shoe box so that they where all together. (Tip: remove the hardware with a screwdriver. From my experience the drill strips the nails which will make it much harder when putting them back on. Now that you have everything organized it's time to start working on the cabinets! 4. Sanding the cabinets! 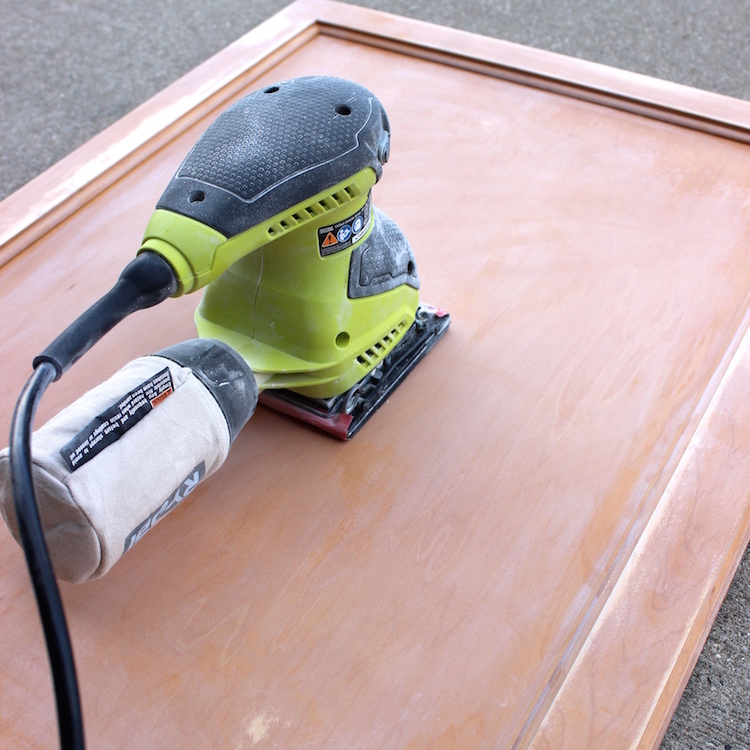 You will find a lot of tutorials on the web where people choose not to sand, but I choose to because I want the primer and paint to stick to the cabinet like glue so that they hold up for years to come! To sand, I switched between using my flat palm sander and the random orbital sander, but used the flat sander more as the roundness of the orbital sander can be quite difficult to get into the corners of the cabinet. I first used 60 grit sand paper and then followed up with 220 grit sand paper to make it smooth. The areas where I couldn't use a power sander, like on the edges, I just used a sanding block in the same two different grits. As you will see in the image below, I did not sand the cabinets down to bare wood. Ideally I would of liked them to but I would of been outside for weeks sanding and, well, nobody has time for that. I sanded them down enough to wear almost all of the shiny glaze was gone. After sanding the cabinets, I removed as much debris as possible by vacuuming and using tack cloth. Here is all the cabinets completely sanded. For some odd reason two of my cabinet doors sanded down to wood in seconds. It was the oddest thing, but definitely not complaining as I know the primer will stick like glue with no problem! 5. Degreasing the cabinets. 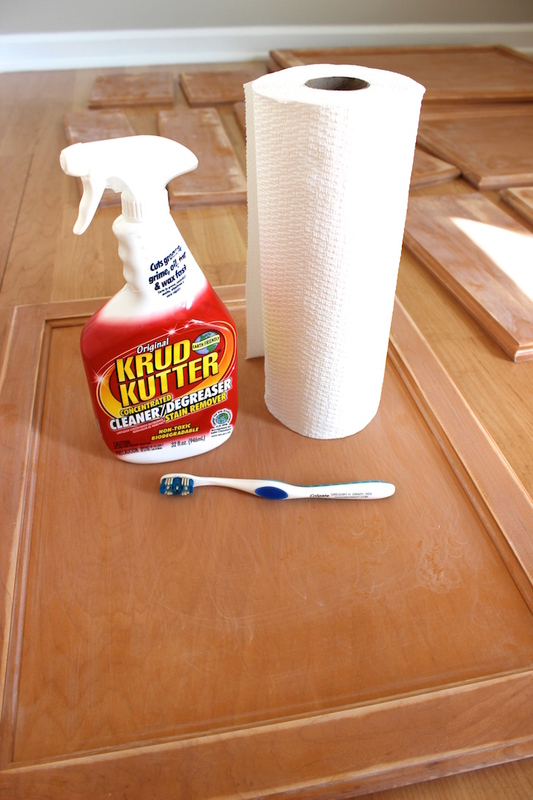 I used the Krud Kutter degreaser and it's one of my new favorite products because it cleans so well! I probably could of done this step before sanding the cabinets, but since a lot of the grease gets sanded away, it seemed more efficient to me to just do it after and wipe away any of the grease that wasn't sanded. I used a paper towel to wipe the cabinets down and then used a toothbrush to get in the tight corners where there was caked on debris. 6. Wipe down the cabinets with a liquid sander deglosser (I used the Klean Strip from Home Depot). Many people just use this as a way to "sand" their cabinets, but I'm glad that I didn't just rely on the liquid deglosser as I didn't think that it did an amazing job at it. I did it to get rid of any possibly left over debris, grease that hadn't been wiped away from step 4 or 5, because again I want the primer to bond and become one with our cabinets. Also, it was quite smelly so I'd recommend to use it outside if possible and make sure to wear gloves and eye protection. 7. 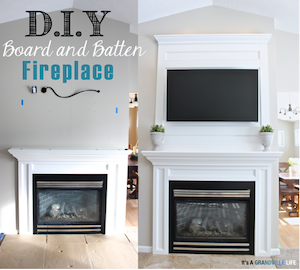 Cut spare pieces of wood up to use as risers for the cabinets. Also, find a place that you want to paint the cabinets and prep the space by covering the surfaces with drop clothes, or I like using craft paper. Okay so now that your cabinets are all prepped it's time to start priming! I'm going to save that for another blog post so stay tuned!